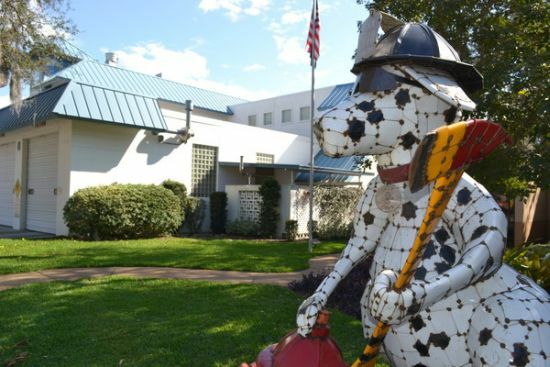 A 9-foot tall Dalmatian sculpture now stands proud next to the Safety Harbor City Hall, on the west shore of Tampa Bay in Pinellas County, Florida. Sculptor Mitch Levin dedicates the life-sized, recycled sculpture to many firefighters who lost their lives while saving 9/11 victims from harm. Patch reports that Floridians can see the recycled steel sculpture greeting visitors at a spot between City Hall and Fire Station #52 through the end of this year. After that, it will find its permanent home at the SHAMc art museum. The Dalmatian sculpture, dubbed as Save Dog Save, was installed in accordance with city’s rotating art series program on Monday. Aside from being a tribute to 9/11 emergency responders, the sculpture will serve as an impressive artwork, which speaks volumes about Levin’s eco creativity. The eco sculpture further attests the need for reducing, reusing and recycling.